For anyone wishing to enter we do check the Experience required and will contact you to confirm details if we think it's necessary. The ability to navigate is very important as none of the route is marked / flagged and there are many route options. The Entry List will be published on this website and you should receive a confirmation email of your entry. Entry Limit of 250. 1) We operate a Reserve List and everyone on the Reserve List got to run last year. 2) The race is only £15 to enter and we hope that anyone dropping out will donate their entry to Woodhead Mountain Rescue. 3) We need to check "Previous Experience"
If we find that someone has run under someone else's number we will report them both to the FRA. It is completely irresponsible and if that "Ghost Runner" went missing we have no contact details or personal information for that runner. I would ask everyone to name and shame such runners. Full waterproof jacket and bottoms (with taped seams), shoes suitable for fell running, long sleeved top, head torch, emergency bag, hat and gloves, map (the Dark Peak map which just excludes Marsden is acceptable) compass, whistle and some emergency food is the minimum kit. There will be a full kit check before Registration giving everybody the chance to make sure they have the required kit. There will be spot checks on route and at the finish. The FRA have made it clear that not carrying the required kit will result in a ban from all fell races and we will uphold that policy. In Marsden Cricket Club (SE 044 106 - just below the Golf Course) from 7am to 8.15am. Race number will be provided on the day. Do not park cars in the car park as this will be closed from midday. Toilets and refreshments are available in the club house. It will be possible to transfer bags of kit to Edale - a van will be in the carpark at Marsden Cricket grounds where you can drop the bag. 2) Number must be shown to Marshalls at all checkpoints and the finish. 3) The Trigger is a GPS NOT ALLOWED race. You may set your watch to record your track but NOT for NAVIGATION. Fieldhead Campsite at Edale (SK123 855) will be the finish. There are toilets and showers here. The bags transported from Marsden will be in a tent after the Finish Tent. There will be room to change in the tents. START: Road outside Marsden Cricket Field (SE 044 106) at 8.30am. FINISH Fieldhead Campsite Edale (SK123 855). There are three road crossings; Wessenden, Crowden and Snake Top - it is the runner's responsibility to cross these roads safely. CP's - There will be water only provided at Crowden and Snake Top. 2) Black Hill / Sliddens. This map shows the three points on the Pennine Way and the three stiles. For 2019 you must use PW3 to Stile A - This is NOT FLAGGED and so make your own way across the moors between the two points. 3) Withins Clough area. To mitigate impact we have introduced a system as on Sliddens above. 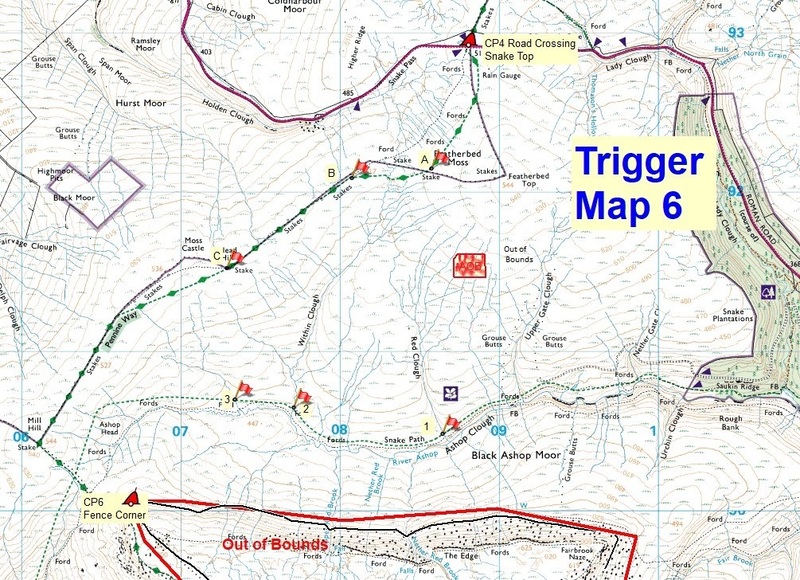 This map shows the three points leaving the Pennine Way and the points in Ashop Clough. For 2019 you must use A to 1. This is NOT FLAGGED and so make your own way across the moors between the two points. 4) Edale - the road is Out of Bounds - see map above. You must use the footpaths in the valley to the Finish. 5) This is a LINEAR ROUTE and runners are expected to make their own arrangements for transport to / from the Start (MARSDEN) and the Finish (EDALE). A hot meal and drinks will be served in Edale Village Hall ; please had in your meal ticket which was given to you at the Finish. Presentation will take place at 2.30pm. Tea and cakes will be available for all supporters/ friends and family for a mandatory donation to Woodhead Mountain Rescue. As already mentioned all the profits from this race will go 100% to Woodhead Mountain Rescue. They will announce the amount raised within two weeks of the race and we will publish the figure on this website, on WMRT site and on Racekit. In the unlikely event of bad weather the deciding factor on whether to postpone the race will be the condition of the A57 Snake Road. If it is closed then we cannot run the race however do not assume that because it is deemed "closed" on the traffic reports that we will automatically be cancelling the race. Woodhead MRT will recce the road on the Saturday and then we will email and post on all the forums / websites we have on Saturday 11th as soon as the decision is made. If we cannot run the race it will be cancelled and people will have the option of donating the entry fee to Mountain Rescue or getting a refund.